BPM Vision Philippines, in partnership with the Project Management Institute of the Philippines (PMI) and the Financial Executives of the Philippines (FINEX), recently hosted a series of events on October 10 and 11, 2018 respectively. The events primarily sought to raise awareness for the internationally well-established practice of Project Portfolio management (PPM), which enables companies to enhance strategic capability to deliver enterprise programs of work in alignment to executive goals and provides C-Level executives with accurate, timely and transparent information needed to make important decisions. Guest speakers included Mr. Mark Bavaresco, the Head of Investment Data and Insights at ANZ Bank — one of the largest banks in Australia and New Zealand who spoke about how he led the transformational journey of the bank adopting Portfolio governance across 10,000 users and 26 counties. 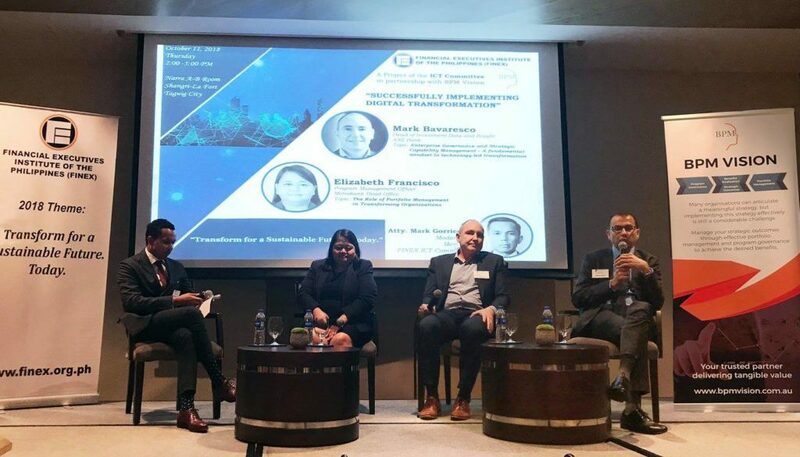 There was also our own Ms. Elizabeth Francisco, a senior executive at one of the largest local banks and lecturer at the UP Center for Technology who spoke about the need for digital transformation and how the practice of Project Portfolio Management can help organizations deliver the expected benefits across the organization. The PPM toolset is used in over 70% of enterprises in North America and Europe across a wide range of industries, and has helped executives gain more visibility into their company’s investments and projects with real-time data and reporting. Through the toolset, companies are able to align projects to business goals; assess and mitigate risks, and properly allocate people and financial resources across its portfolio of projects. PPM has continued to gain traction in the Asia-Pacific region, and BPM Vision is at the forefront of its adoption in large enterprises in the region. As experts in the implementation of enterprise IT solutions, BPM Vision is well-equipped to guide companies through their digital transformation journey and has been doing so for the past 10 years. It is important to recognize the importance of change management in any organizational transition, and BPM Vision works together with an organization’s internal team to ensure that employees understand and embrace the changes brought about by new organization initiatives across business and IT. The company has entities in Australia, Singapore, Hong Kong, and the Philippines, and has executed projects in various other countries in the Asia-Pacific Region with well known corporates across Business and Government. BPM Vision partners with industry bodies in its bid to raise awareness of the benefits of Project Portfolio Management amongst the executive leadership and Boards.